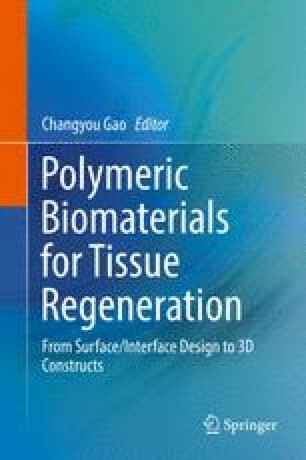 Hydrogel-based scaffolds remain a prevalent choice for regenerative medical treatments because of their capacities of imitating native extracellular matrices. Hydrogel can be classified into either synthetic or natural origins. The natural hydrogels are certainly cell benevolent as they mimic the natural microenvironment of the native tissue environment. On the other hand, the nonlethal synthetic hydrogel is hydrophilic and can be tuneable for customised application. This section presents current established gelation mechanism of the hydrogel. The philosophies can be ordered into physical, chemical and biological cross-linking. Bioactive particles known to enhance the functionalities of the hydrogel can be fused into the hydrogel-based scaffold with the approaches of these strategies. Because of the high calibre of hydrogels, the scaffolds have much capacities and applications in regenerative medicine. One of the brilliant standard hydrogels, polyethylene glycol (PEG), is displayed as a classic case to show the theories presented in the first three sections of this chapter which clarified the fusion of different useful particles (e.g. cell-adhesive molecules, enzymatically degradable molecules and cell recognition bioactive molecules) in the hydrogel-based scaffolds. Overall, this chapter intends to provide some insights in the general strategies for designing hydrogel scaffolds with desired functionalities. http://worldaccount.basf.com/wa/NAFTA~en_US/Catalog/ChemicalsNAFTA/pi/BASF/Brand/pluronic. Viewed 22 January 2016.